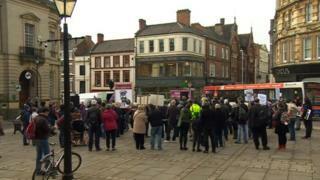 A protest against plans to cut bus subsidies, gritting and trading standards budgets has taken place in Northampton. The demonstration by Save Northants Services follows a ban on nearly all expenditure by Northamptonshire County Council, which faces a £21.1m overspend for 2017-18. Speakers included comic book writer Alan Moore. The council is due to make a decision this week over next year's budget. This will include a council tax rise of almost 6% and £29m in savings. The council is under emergency spending controls over fears it may not balance the books this financial year. A government inspector is looking into its financial management and is due to release a report next month. Anjona Roy of the Save Northants Services group and chief executive of Northamptonshire Rights and Equality Council, said: "We are demonstrating because there have been a number of dramatic proposals in the budget to cut important services. "With the council in such bad shape, we really fear more could go. "I also think that a lot of people perhaps don't know about what is being proposed and that services they are using are on the path to being cut."